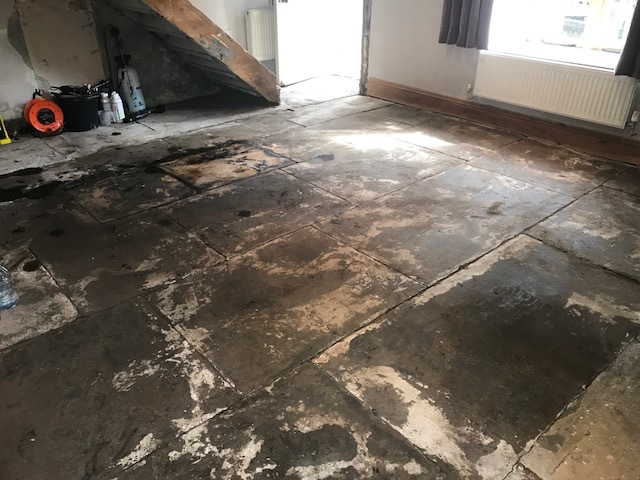 This property in Sedgefield, County Durham, recently came under new ownership and the new owner planned several renovations including replacing the carpet in the front room. 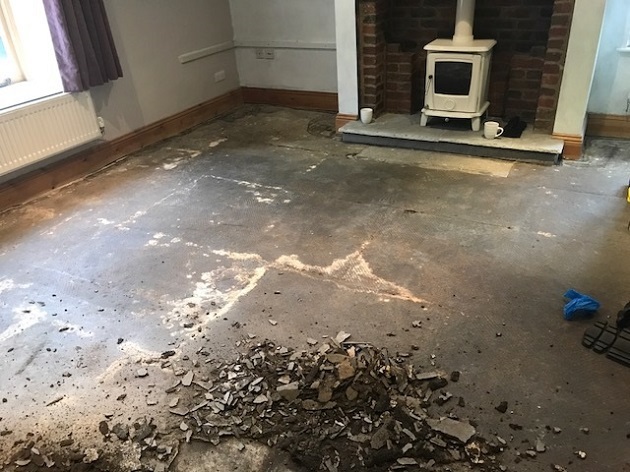 Removing the carpet was straightforward but unfortunately it had been glued down using a good layer of bitumen which left quite a mess and upon further inspection she realised there was a perfectly sound Yorkshire flagstone floor underneath. 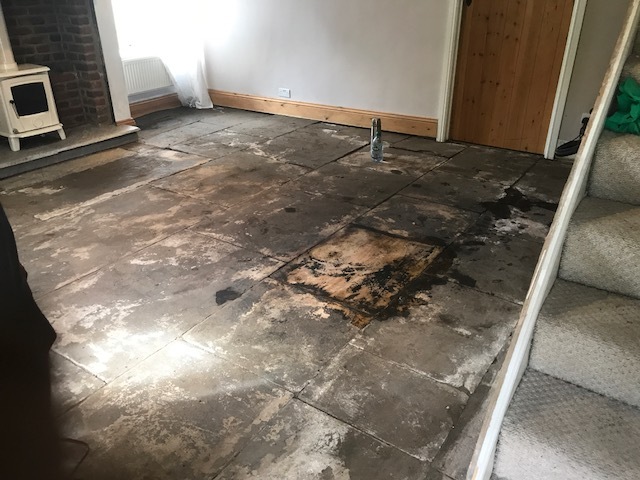 Realising the flagstones would make an impressive floor she was keen to have them restored and spoke to a number of people including a builder who all said it would be an impossible job. Bitumen is an awful material and it was clear removing it from the stone would not be easy. 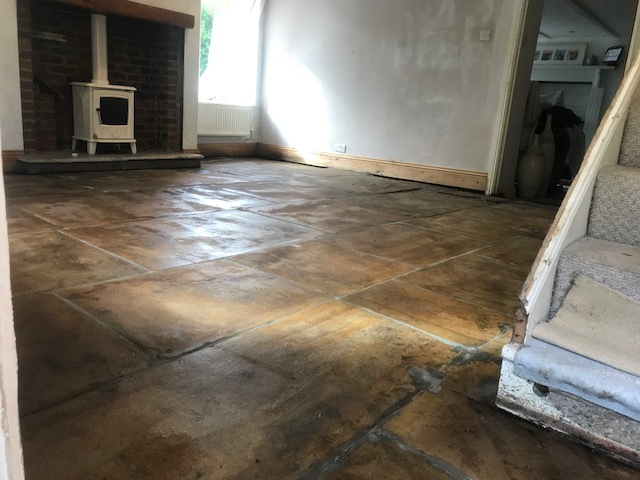 Having exhausted local connections, she turned to the internet and came across details of a Victorian floor stained with Bitumen that a colleague of mine had worked on and so gave Tile Doctor a call. With a floor like this you can’t really make too many promises as to the outcome or how long it will take however we do access to a lot of experience and some very powerful cleaning products so I was confident we could improve the look of the floor significantly. To start we carefully scrapped off as much of the black bitumen as possible which took a lot longer than I had initially thought. 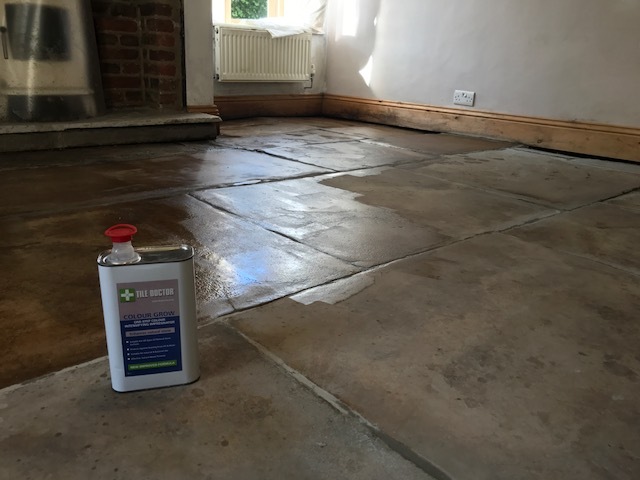 Next I created a strong mixture of two Tile Doctor Products Acid Gel and Nanotech HBU Remover applying it in sections to the floor like a poultice and leaving it to soak in for a while before agitating it with a rotary scrubber. Acid Gel is used to remove minerals such as salt deposits, cement and grout smears and in this case, I felt it would also help to weaken the Bitumen. Nantotech HBU is another strong product which is named after the tiny Nano sized particles it contains and HBU is an acronym for Heavy Build-Up. After being worked into floor it was rinsed off with water to neutralise the acid and the resultant slurry extracted using a wet vacuum. Once a section was clear we moved onto the next and repeated the process, we also spot treated any ugly spots that needed further treatment. 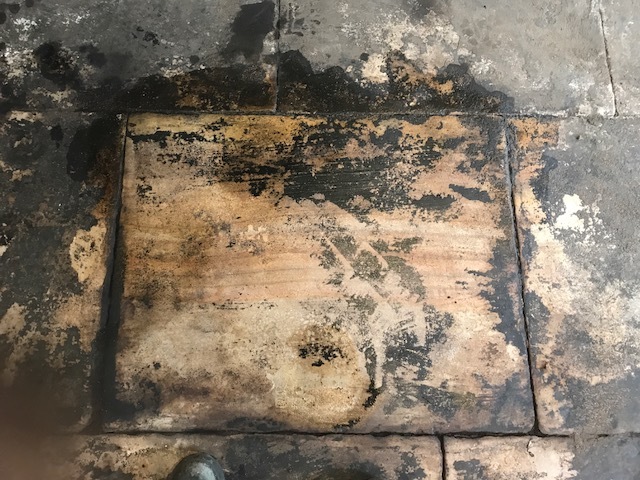 It took about a week to complete the cleaning but using this process I’m happy to report we were able to remove about 99% of the Bitumen and the Flagstone floor was now fully visible. 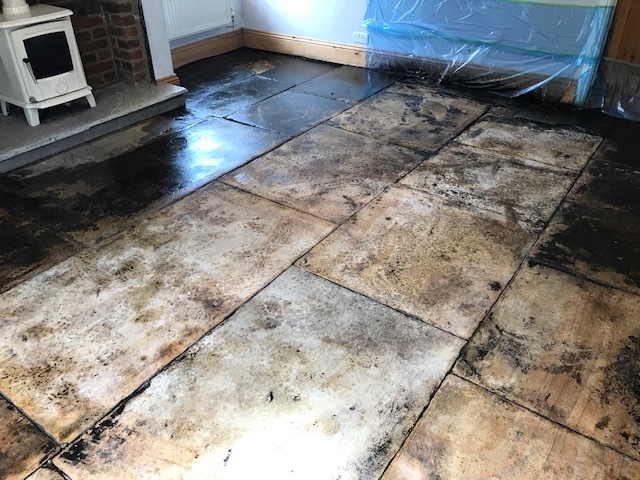 The floor was left to dry overnight and I returned the next day to seal the floor first checking it for dampness using a Damp Meter. 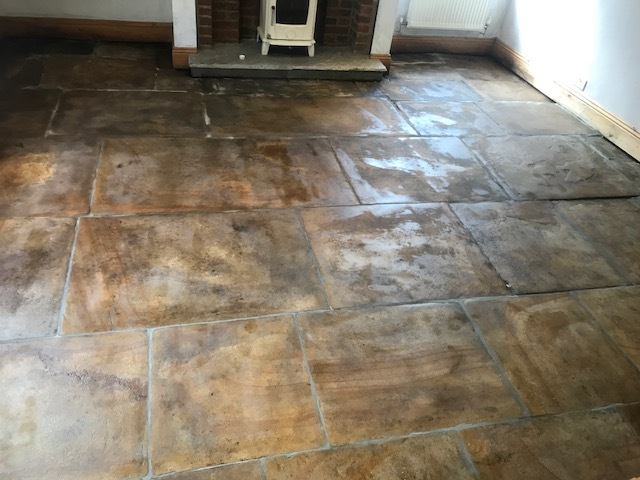 The flagstones were dry so I then proceeded to seal the floor using a couple of coats of Tile Doctor Colour Grow which is a matt sealer that impregnates the pores of the stone protecting it from within whilst enhancing the natural colours of the stone. Whilst the Yorkshire stone had been darkened by the Bitumen in places it has defiantly added a lot of character to the floor and blends in well with the rustic wood burner in the hearth. Certainly the owner was very pleased with the difference we had made and left the following feedback on the Tile Doctor Feedback system. Please Note: Photos above taken as the sealer was drying.